What I want to know is, who the heck are “they” and why are “they” telling me when and what I should eat? Fortunately for “them,” I actually like breakfast. Unfortunately for “them,” I like sleep even more. In the competition between sleep and breakfast, well, the snooze button usually wins out. But some days when I’m on the road, lunch and bathroom breaks just aren’t an option. It’s racing the Ford Focus rental from one meeting to the next. And I knew today was going to be one of those days. So I set the alarm for an hour early and set out to find a good place in San Diego for breakfast – the only meal I’d get until 10 pm that night. An old-fashioned diner is always a good bet for breakfast. And my research led me to the Studio Diner, oddly set smack dab in the middle of some godforsaken industrial park north of San Diego. Of course “old-fashioned” in California means circa 1985. 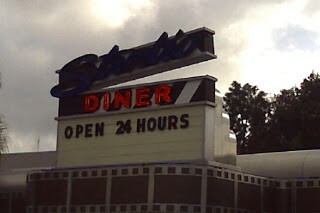 Yeah, I’m pretty sure the Studio Diner doesn’t date back even that far. Too clean and modern to be “retro.” Too pedestrian to be California “foodie.” The Studio Diner lacks the pizzazz needed to be a true shirt-buying worthy diner. Located across the street from Northrop Grumman and the corporate headquarters of Jack In The Box, Studio Diner is strangely out of place. Apparently, some sort of second-rate television studio is nearby, which explains the name. 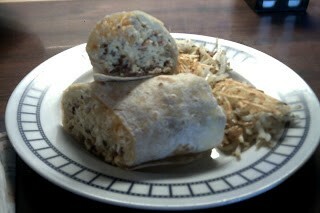 I took a spot at the counter and ordered the breakfast burrito. The waitress was friendly while she expertly took orders, bussed the counter, and made fun of her overly-talkative regulars. The scrambled eggs, bacon and melted cheese wrapped in a warm tortilla and a side of salsa were certain to keep my stomach full until my next meal 12 hours later. 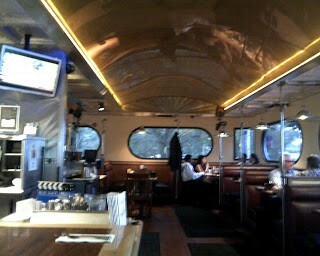 The standard diner hash browns on the side weren’t bad either. So the real question after eating breakfast here was whether or not my burrito and hash browns were worth losing an extra hour of precious sleep.